Returned to Italy was the Mariegola from the Scuola di Santa Maria di Valverde della Misericordia, dating to 1392. The pages were out of order. That much was clear soon after Lisa Fagin Davis began to review the gilded Italian manuscript written in the 14th century and kept at the Boston Public Library. But that wasn’t the only sign something was amiss. Davis, reviewing the library’s sizable collection of medieval manuscripts as part of an electronic cataloging project, noticed that the book was not in its original wood-and-leather cover, and the chapter numbers had been scraped away. Somebody had taken pains to obscure the provenance of the manuscript. Those questions helped lead the library to conclude the document did not belong in Boston, but instead should return home, to its land of origin. On Wednesday, the city and representatives from the US and Italian governments held a ceremony to formally transfer custody. The repatriation event also included two other items from the library’s special collections: a book that had been discovered missing from the collection of a 16th-century Sicilian cardinal and an ornately adorned page from a similar manuscript. The items were appraised at as much as $110,000 total for the three. Beth Prindle, head of the library’s special collections, said the decision to return the documents was easy, though it was sad to part with such compelling items. “It feels very disappointing, but it is also something that is an acknowledged part of the work that we do,” Prindle said. Officials emphasized that the library did nothing wrong when buying the items from reputable dealers, and that the institution had moved quickly to begin the repatriation process, which takes years, when it became clear the artifacts should return to Italy. Such situations are rare, however. 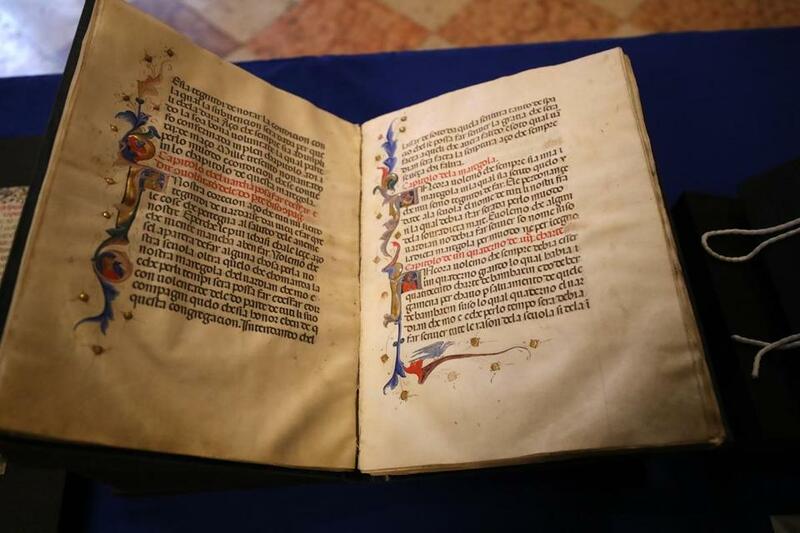 Davis, who has been working with medieval manuscripts for about 25 years, said she had never made a discovery that resulted in the repatriation of an item. At the Boston library, she was involved in the identification of all three items returned to Italy. 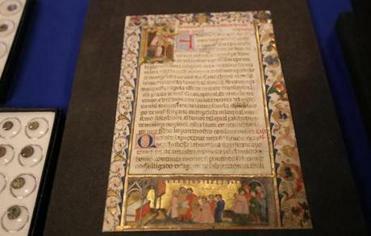 One of the items included an illuminated page of the Scuola Grande di San Giovanni Evangelistas, dating from between 1418-1422. The 14th-century manuscript, called Mariegola della Scuola di Santa Maria della Misericordia, is a set of organizing principles for a fraternal religious order in which members — who were not monks — observed rituals including self-flagellation. The document lays out rules as granular as how to make and use candles as part of the group’s activities. When the library acquired the manuscript in 1960, conservators knew how old it was, part of its title — and that it was interesting. Officials paid $2,500 for it. Davis could see that the pages had been shuffled, noticing the choppy nature of the text and that there were imprints on the parchment that did not match what was on their facing pages. The manuscript was also missing a cover page that would have clearly identified it. She began looking for references to the document in other texts, and found some that led her closer to the source. Finally, at one of Harvard’s libraries, she discovered a copy of a cover page that matched up with the book. She had found the answer. “I jumped up and down in the library, and I did a little victory dance,” she said. It turned out the manuscript was one of several volumes that disappeared from the State Archive of Venice in the 1940s. It’s still not totally clear how it got to America, but it was never intended to be here. Italian authorities cheered the return of the cherished objects, which also included a collection of Roman coins seized by US Homeland Security Investigations. Nicola De Santis, the Italian consul general in Boston, said in an interview that the transfer highlights the lively exchange between his nation and this region, citing the Sandro Botticelli exhibition that just opened at the Museum of Fine Arts . Davis had begun her review of the documents in 2010, and the repatriation process spanned a difficult period for the library’s special collections, which include about 250,000 rare books and more than a million manuscripts. Prindle took over as head of special collections in 2015, following the misplacing of two valuable prints — later found — at the Copley Square library. But there’s no way to be sure. The library continues to digitize its collections, a process that could reveal untold origin stories leading other items back to their rightful homes. As workers boxed up the Italian properties and began to cart them away, Prindle turned her back — she couldn’t watch. Davis placed her hand one last time on the parchment pages, a chance to say goodbye to the historic treasure she’d come to cherish. 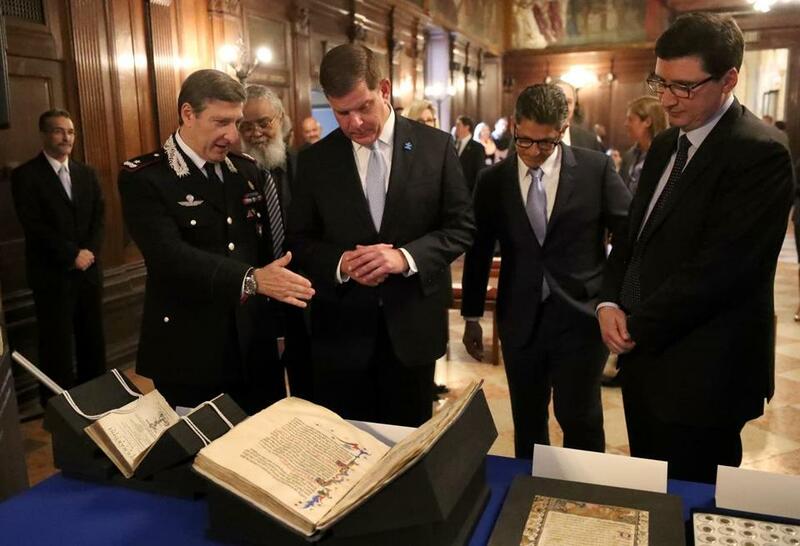 A repatriation ceremony with (left to right) : Brigadier General Fabrizio Parrulli, Carabinieri Commander for the Protection of Cultural Heritage, Mayor Martin J. Walsh, Matthew Etre, Special Agent in Charge at DHS-ICE Homeland Security Investigations and Nicola De Santis Consul General of Italy Boston.